Even though it’s not technically fall (and judging by the current temperatures, won’t even remotely feel like fall for quite some time), September does, in fact, mark the last quarter of the year. And once the year is over? That means the marathon is here. My training plan hybrid calls for three training runs a week. However, last week I ran four times, so this week, I decided to run twice, with the second run being a makeup 13 miler. The rest of my time was jam-packed with school stuff and some things going on around the house. Little man had spent the night at his grandparent’s house, and we decided we would pick him up and treat everyone to a showing of Teenage Mutant Ninja Turtles. We had been tossing around the idea of it and after several positive reviews from friends, we decided to go for it. Even though it’s been a long time since I’ve been blown away by a Michael Bay movie (pun not intended), this was actually really enjoyable and little man loved it. I still prefer the original 80s film version, but it was a nice time with family. Nothing to see here. Just a regular, sluggish 3.1 mile run. I wasn’t particularly impressed with myself, but the humidity has been out of control and the string of early mornings has been doing a number on me. I was running up against a storm, too, and that’s always fun. I had a commitment to volunteer at a school event this morning so I was up and out early for that. I spent the rest of the day watching my hydration and nutrition for my intended long run. I originally planned my long run for this morning, but little man came home from school on Wednesday night with a fever. It broke around 1:00 AM, but school policy is 24 hours fever-free before returning to school, so it was a day off for him. Since he wasn’t feeling great, he came into our room to snuggle in the middle of the night, and no one got a great night’s sleep. I was more than happy to stay in bed late rather than force myself out for a run. Whatever bug he had seemed to pass quickly with no other symptoms and without passing on to anyone else, and for that, we are very glad. Oh, and also, I came home to find this underway in my backyard. Another awful night’s sleep. I’m not sure what’s going on, but I have been unable to nap more than 15-20 minutes and I am having a tough time getting to sleep at night. I need to get a handle on it because exhaustion is good for no runner. We enjoyed a birthday party for one of little man’s buddies, with friends, and then settled in to watch the start of NCAA football. On a recovery note, I was really worried about another bout of plantar fasciitis. After all, the last time it reared its ugly head was after a 13.1 mile distance. However, I woke up in the morning, and found myself able to walk, pain-free. I was worried because I missed yoga entirely this week, and I’ve had to cut from two classes down to one, but I did my calf stretches on my own and hoped for the best. Hooray for small victories! I felt pretty discouraged this week. Again, I’ll go into more of that later in the week, but my difficulties on Friday’s run were humbling. My logical side knows that it’s just one more step on the way to that marathon finish line, but it’s hard to get that through to my emotional side. All part of the process, my friends. All part of the process. Aside from that, August was a good month. I tallied 58 miles (a little shy of my intended goal), but I feel they were productive, solid miles. For the year, I am at 268 miles, and my all-time total is 898.87. I can’t wait to cross that 900 mile mark. So close! 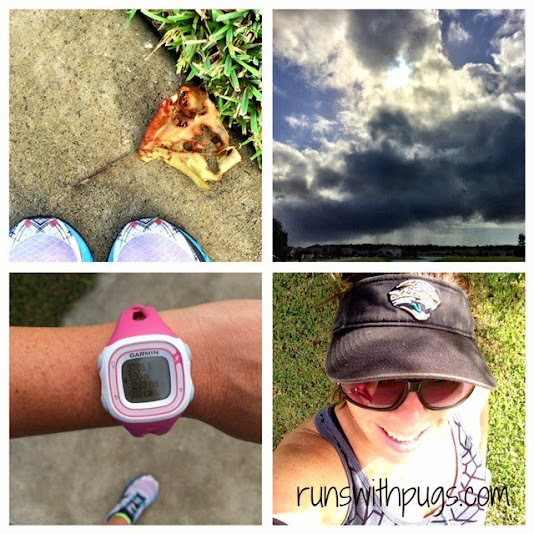 More long runs will lead to more miles in September. I had one race scheduled (which I ran yesterday), and I am through racing until October. Now that I have the school routine pretty much down, I can get back on track with my yoga and cross-training, which will help me feel stronger and more in control of my runs. 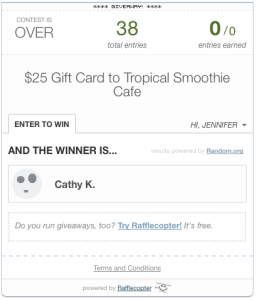 Congratulations to our Tropical Smoothie Winner: Cathy K.! 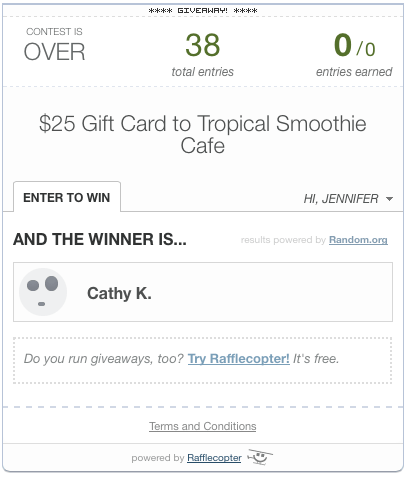 Email me with your address so I can mail your gift card! How did August treat you? Have you had any recent runs that just got the better of you? Nice work getting it done! I still haven’t even gotten out the door… I had plans to go this morning, but yesterday I slammed my head into a fire extinguisher and have a nasty lump (and I imagine bruise, but it’s under my hair thank goodness!) so decided not to push it. Maybe tomorrow? I can’t believe it’s already September. Where did this year go? I’m not ready for winter. NOT READY. Ouch! That’s awful! You poor thing! I hope you feel better soon. I’m sure you northerners are really dreading the return of winter. However, it will be a bit of a welcome break for us down here. I don’t think it was this hot when I lived down in SoFla! So glad the little man is feeling better! Me, too! Fevers freak me out because he so rarely gets them. 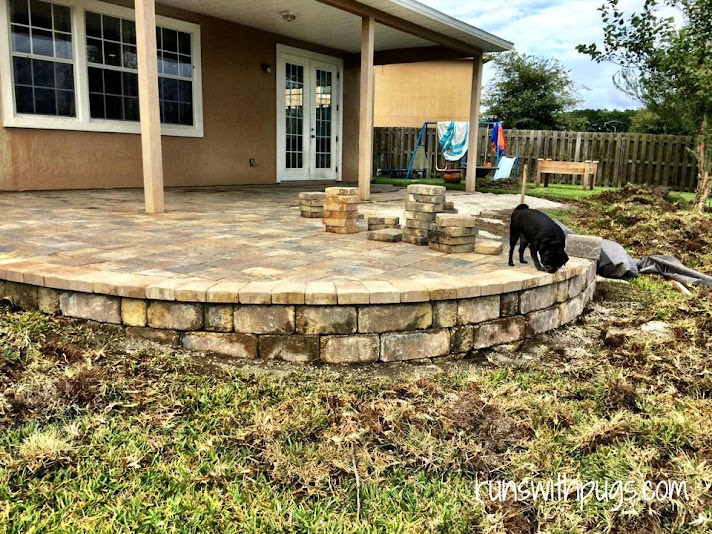 That rock patio is beautiful!!!! Least you were able to see a beautiful sky on the way! While you are going into fall we are coming into Spring, we’ve had some beautiful spring weather lately and I’m loving it. August was good to me, and I hope September is good to me too. And I wouldn’t stress too much over the .4mi you went out and got it done, that’s something to be proud of. Those .4 miles are really sticking it to me. It bugs me, but I’ll get them back. Not to worry! I know September is going to be awesome for you!